Never use on a Loaded firearm. 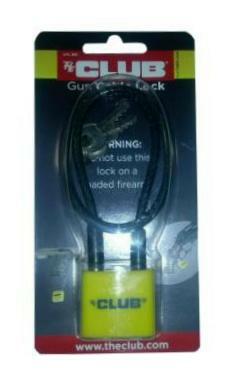 The Club Gun Cable Lock has several applications. It is for shotguns, rifles and some revolvers. When properly installed, the cable prohibits a round of ammunition from being chambered. The Gun Cable Lock can also be used to prevent the pumping of a lever action rifle by restricting the lever's movement. Protective vinyl covered 14" cable reduces accidental or unwanted use of firearms. Made of flexible woven steel cable. Fits most handguns, rifles and shotguns. This item is NOT California approved. Please see item UTL883 or UTL883KA (keyed alike) for California approved locks.